So far watching Elvis Presley’s filmography has been arduous. I’ve struggled to watch and write about his first four films. Maybe this is about to change because King Creole, Presley’s final film before his military stint, has been my favorite Elvis movie thus far. Granted, King Creole benefits from following two subpar films and one mostly okay film. 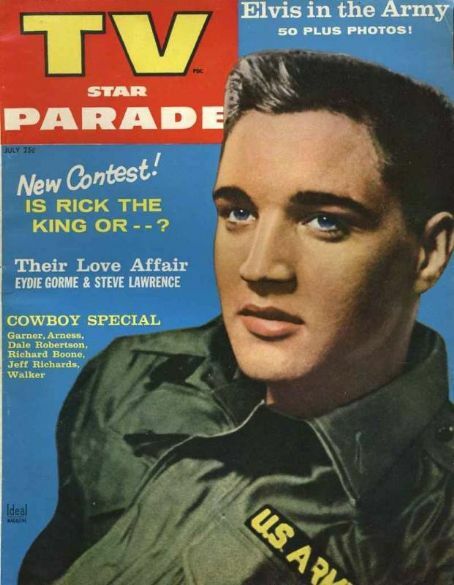 Love Me Tender (1956) – Elvis’s first movie is a post-Civil War drama. Elvis plays a man who marries his brother’s girl after his brother is mistakenly reported dead. The musical numbers were added on to capitalize on the singer’s growing stardom. Melodrama ensues. Loving You (1957) – Elvis plays an exaggerated version of himself. Here he is a young singer plucked from obscurity by a overzealous publicist much to the displeasure of the older generation. Jailhouse Rock (1957) – Arguably Presley’s most popular films, despite the fact that Elvis plays a huge d-bag. 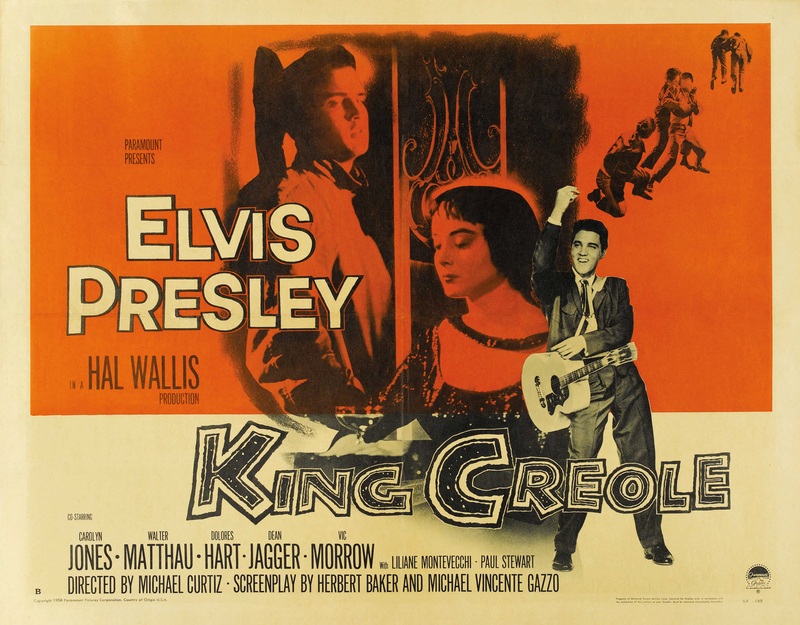 What King Creole shows is that if Presley is paired with a good director (Michael Curtiz), talented supporting actors (Walter Matthau; Carolyn Jones) and even better music, the entertainer’s natural charm outshines anything outlandish. 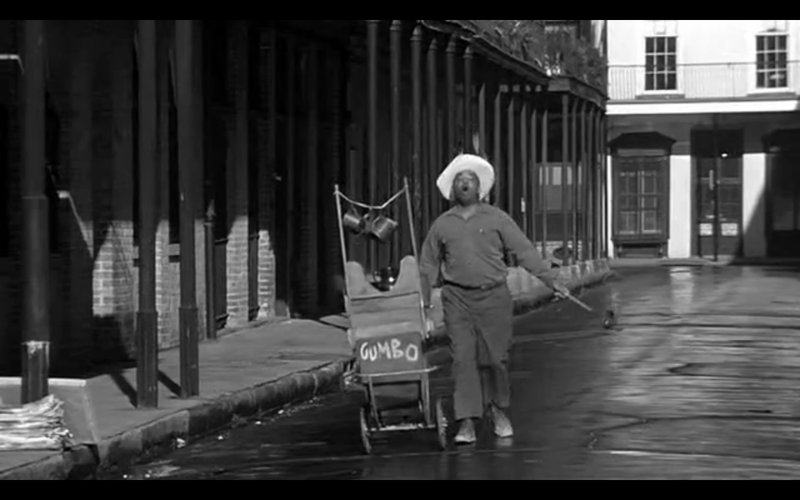 The Gumbo man appears in King Creole‘s opening minute. At first the film’s opening, three characters singing as they deliver food through New Orleans French Quarter, is jarring. What purpose do these characters serve? Is their presence complicated by various racial undertones? Am I the only person now craving gumbo? But then the film transitions to “Crawfish,” a duet sung between Presley and Kitty White, and the complete sequence winds up having a vibrant, soulful quality. “Crawfish” provides a crucial introduction to the film’s setting (New Orleans), a style of music incorporated in Elvis’s music (jazz), and King Creole‘s protagonist, Danny Fisher. This is also the first instance when Elvis’s character is introduced during a musical number and presented as a singer from the outset. Love Me Tender‘s Clint Reno is a ecstatic kid plowing a field; Loving You‘s Deke Rivers is a sullen delivery boy; and Jailhouse Rock‘s Vince Everett is a jovial contraction worker. These three characters don’t realize they have a singing ability talent until someone else points it out to them. Danny Fisher, however, knows he can sing. He just hasn’t capitalized on his talent yet because he has other concerns. In many ways, Danny is a typical Elvis character. (Thus far.) He’s a hot-headed working class kid with family issues. After his mother dies and his father loses his job, Danny becomes a provider for his family by working at a nightclub. (Sweeping the floors, natch.) On the day he is supposed to graduate from high school, Danny saves a woman from her abusive date, gets into a schoolyard brawl that forces him to drop out of high school, and gets involved with a gang. In sum, Danny Fisher is a mess. Like every cunning gang leader, Shark (Vic Morrow) recognizes that Danny’s talent is useful for shoplifting. He has Danny perform “Lover Doll” and distract the customers while he steals. Shark gets bonus points for his creativity. King Creole emphasizes the two types of women found in an Elvis movie: the young virginal girl and the older vixen. Here the young virginal girl is Nellie, played by Dolores Hart. Fittingly, Hart is now a nun. The older vixen is Ronnie, played by Carolyn Jones. Fittingly, Jones would go on to play Morticia Adams. Could they look anymore uncomfortable? Danny meets Nellie after his performance and she doesn’t rat him out to the authorities. In return, Danny invites her to a party at a hotel… except no one is at the party and Danny just wants to get in her pants. Nellie is stunned and refuses Danny’s advances but, like in any episode of Degrassi, she still wants to see him. When Maxie realizes that the kid can sing, he wants Danny to perform solely at his nightclubs. Danny turns him down out of loyalty to the King Creole and as a result Danny finds himself mixed up with New Orleans’ crime scene. This affects his family (his father is assaulted), his career (it is momentarily stalled), and his romances (one of his lady loves gets killed). The highlight of King Creole isn’t any of the performances. It is the climactic showdown between Danny and Maxie. The film gradually builds to this scene and Danny’s eventual redemption. King Creole is the first time I actually considered Elvis Presley to be a decent actor and I’m curious how what happens next in Elvis’s effects his films.